A home in the country can often be an oasis in the busyness of life, a calming atmosphere to sit back and catch your breath. There is much to be desired in an agrarian home surrounded by open fields, lofty green trees and that fresh outdoor scent. And if you had the opportunity, as this homeowner did, to rebuild your grandparents' farmhouse, you would likely jump at the chance. It can be so rewarding to add new memories, and materials, to a generational home — an act that brings new life and vision for the future. 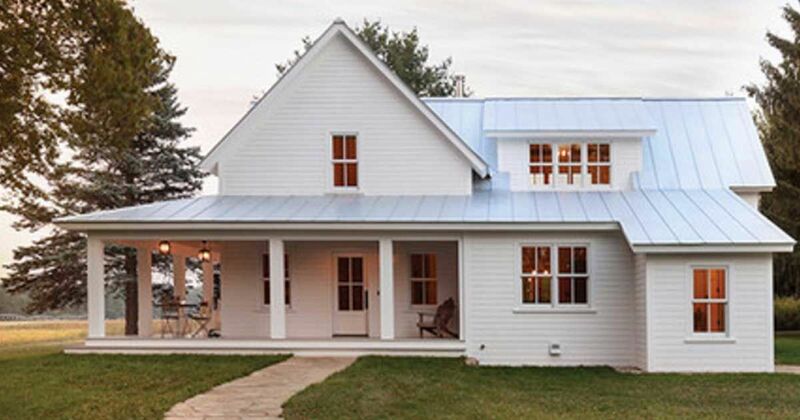 This family farmhouse is built with classic farmhouse architecture. 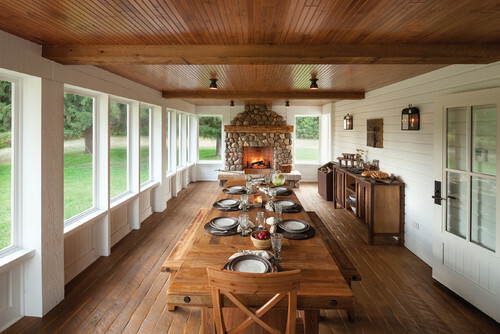 Supported by substantial wood beams, an open wraparound porch provides additional living space. 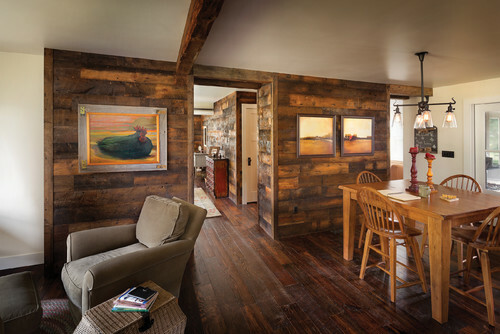 Details like the wood-clad ceiling and farmhouse lighting make it feel homey and welcoming. Another porch, facing the backyard, makes space for food and relaxation with a long dining table and stone fireplace. Much of the home's interior is painted a classic white, accented by rustic wood flooring and a few wood-paneled walls. A U-shaped kitchen provides a plethora of counter space. Details like curved undercabinet cornices and Moroccan tiles add softness and femininity. 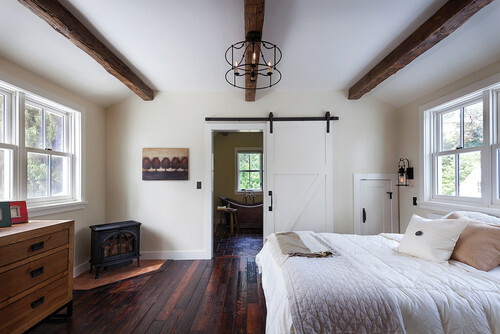 The master suite features many bucolic details, like the sliding barn-wood doors, original hardwood floors and generous ceiling beams. A tiny fireplace, set in the corner of the bedroom, offers additional warmth during those chilly winter months. The master bath is outfitted with a burnished copper bathtub ideal for long, relaxing soaks in the evening. 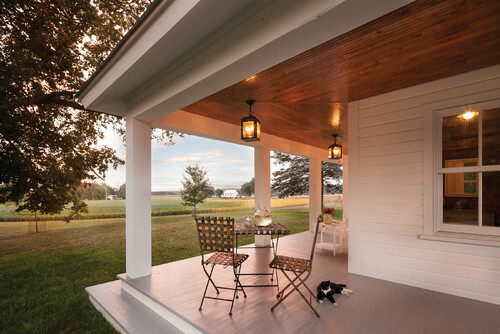 A wraparound porch provides plenty of space to stretch out and enjoy the outdoors. The spacious back porch features a wood-paneled ceiling and gorgeous stone fireplace. 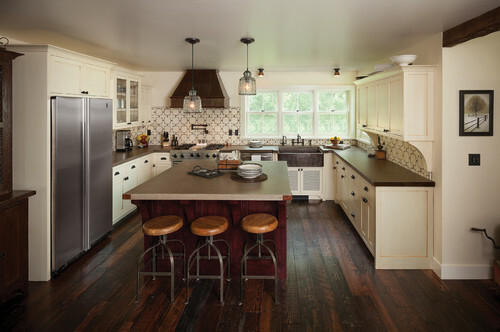 The country kitchen has many interesting elements, like the glass pendants, a farmhouse sink and a coordinating range hood. The dining room and sitting room are open to one another to accommodate holiday gatherings and dinner with friends. The cozy master bath has a certain rustic appeal with worn furniture and a freestanding bathtub. This is certainly a farmhouse that is worth sharing, so tell your friends on Facebook about it.